Welcome back to the blog! 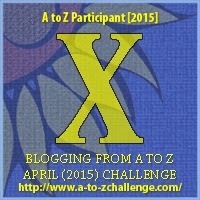 For the A to Z Blogging challenge today I’ve got Amber Butler talking about Xenogenesis. Xenogenesis is the laboratory creation of an organism that is completely different from either of its parents. This, I feel, is fantastically relevant to writing. Our books and stories are organisms. We breathe life into them and birth them and let them wander our world like toddling children, and they may be the class clown or the class bully or the kid who sits under the window and eats paint and they may make friends or they may make enemies but they are alive and apart from us and once we have sent them into the world they grow without us tending them. Our stories are sometimes created organically, from the fusion of multiple ideas. You may wake up one morning and find a character has walked through your dreams and whispered his story to you and you are merely the caretaker and must tend to the story and feed it and nurture it and kiss its knee when it falls off its bike and eventually let it go. And these stories are good. They are necessary and cherished but are not what this blog post is about. This post is about the willful creation of things unlike other things. This post is about taking your writing down new and previously unforged paths. It is, in short, how to intentionally design your stories to be organisms completely different from the things you’ve done before. This age-old bit of wisdom never rings truer than when you are trying to create something unique. Go to your local bookstore and wander into a corner you’ve never wandered into before. Pick up a book that looks like something that wouldn’t interest you if the apocalypse had destroyed all other books and this was your last hope for any reading material until the end of time. Reading outside your genre will stretch you as an author in ways that will lend remarkable authenticity to your story. Only write YA dystopian? Read a (good) romance novel. Even if your main character only has one scene where his/her heart pounds after the boy/girl in gym class, that wisdom you’ve stored up from extragenre reading will make your readers’ hearts pound, too. Only write romance novels? Read a good mystery. You get the idea. I don’t mean whole novels. If you asked me to write a romance novel I’d put the characters in a spaceship fleeing a ravaged post-World War III earth and make a love triangle with an alien, a robot, and a sentient, formless being made of light. I’m a scifi/fantasy geek at heart and you can’t remove that part of me. However, short stories and flash fictions are the way to practice your writing chops in areas where you don’t have any. There are tons of places to find writing prompts (the sub-Reddits “Writing Prompts” and “Prompt of the Day” happen to be my favorites) and make yourself write in a genre you wouldn’t normally write in. For instance, I found a prompt that was an image of a storm in a sky and immediately wrote a story about a woman who collected weather patterns and kept them in mason jars in her closet. If I were practicing extragenre discourse, I would have written about wandering a well-worn path pining for a lost love, or combing the beaches to find pieces of a missing body, or fighting the battle of Gettysburg under a dark sky. Write a sentence. Erase it. Write the opposite. Sometimes sentences and characters and plots are born from that organic merging of other sentences and characters and plots and are beautiful in their own right. But when you are trying to create something that is genuinely unique, you may have to go against the instincts of your own brain, which tends toward the familiar in almost all things. I grimaced. I hate making small talk. Small talk and people and weather are tedious and boring and make me want to drink a cup of coffee still steaming, make me want to throw that coffee in other people’s faces. I grinned. I love making small talk. Small talk and people and weather are fascinating and infinite and make me want to share a steaming cup of coffee with them, find out how many creamers they take, listen to every story they have to tell. I watched her. She would never pay attention to me, the weird boy with the cartoon hair and the lisp. I watched the way her blond curls bounced when she jumped and the way her lips opened too wide on the right when she laughed and the way she wiped the mud from playing in the creek bed off on her pants. I watched him. He would never pay attention to me, the weird boy with the cartoon hair and the lisp. I watched the way his blond curls bounced when he jumped and the way his lips opened too wide on the right when he laughed and the way he wiped the mud from playing in the creek bed off on his pants. Notice there is nothing wrong with the crossed out version. It is simply what came to my mind first. I erased it, then wrote something else. In this way you can create characters that are different from the characters your brain is used to reading and writing. Your stories will have a surprising bit of nuance and depth and take you places you never thought you could go. Then make several lists defining characteristics such as physical appearance and sexual orientation. Roll dice to match each character with their traits. Obviously you are the artist and can veto whatever you want, but this will help put a large distance between you and the awkward-but-adorably-clumsy teenage girl who is different because she likes to read books, the ruggedly-handsome-but-ultimately-wild-and-dangerous boy she is in love with, and the nerdy-and-goofy-but-equally-adorable boy she is also in love with. You probably have this one covered, but in case you don’t, do it. A good rule of thumb: If anyone ever says, “Your book reminded me of ____,” read that book. If you write mystery or horror, read King. If you write fantasy, read Gaiman. If you write speculative or dystopian fiction, read Atwood. If you write sci fi satire, read Pratchett and Adams. If you write YA lit, read Green. Is this an exhaustive list? Obviously not, but you get the idea. Read them slowly. Don’t rush. Savor the words, like a warm, juicy, red steak, let the prose dissolve on your tongue and trickle down your throat and fill up your stomach and you will find your own words and worlds enhanced. There is nothing wrong with reading authors who are not considered “great” or who are not well known–in fact, I highly recommend it as there are some breathtaking hidden gems out there. But too frequently authors don’t read the ones who others consider to be the peak of their genre, sometimes out of moral repugnancy (“I refuse to bow to the whims of publishing companies!”) sometimes out of ignorance (“Levithan who?”) but it never bodes well and almost always ends in subpar prose and rehashed plot lines and stale characters and awkward dialogue. Read much, and read often, and always, always, read the greats. Bio: A K Butler publishes a blog where you can read her short stories and flash fictions for free. 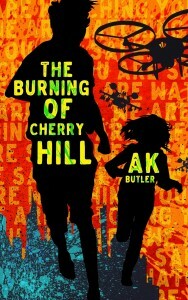 She has written a YA science fiction novel, The Burning of Cherry Hill, which is available on Amazon. She is frequently found on Twitter fangirling over books she loves, Firefly, and Doctor Who. You can also find her on Facebook. Great tips. I do try to read outside my favourite genres and I challenge myself to write things I wouldn’t normally write.